This is not your regular everyday rice kheer, it is rice kheer that is made richer and creamier with rich milk solids of Khoya or Mawa. 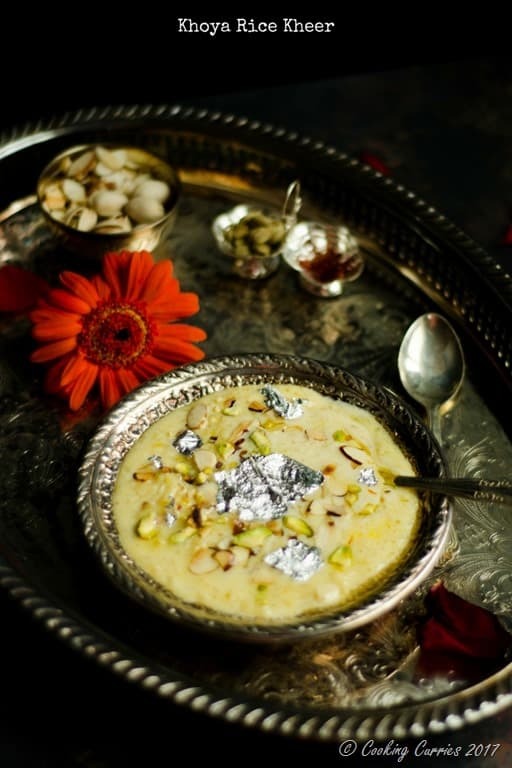 Put this Khoya Rice Kheer on your meal plan for the upcoming Indian festival season. August is the beginning of the festive season in India, starting with Raksha Bandhan, then Ganesh Chathurthi, Janmashtami, Navarathri and culminating with the big pompous affair of Diwali. There are several more smaller festivals that are celebrated regionally but these are the big ones. I can never have enough of festival dishes of desserts like kheer / payasam, laddoos and halwas and savories like kara sev, chivda, murukku and mixture. Over time, I have found it easier to make a list around this time, of all the dishes I want to tackle this season. It helps a lot and I get to try a lot of new dishes too. 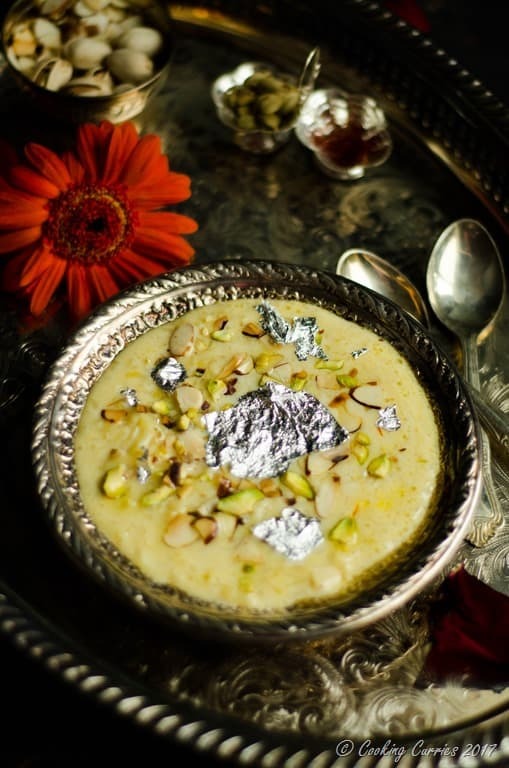 I made this Khoya Rice Kheer for Holi, earlier this year, for a crowd of about 15 people and even though this recipe makes 20 servings, you can easily half or quarter the recipe to make for 10 or 5 people also. It is a fairly easy recipe with minimum ingredients. 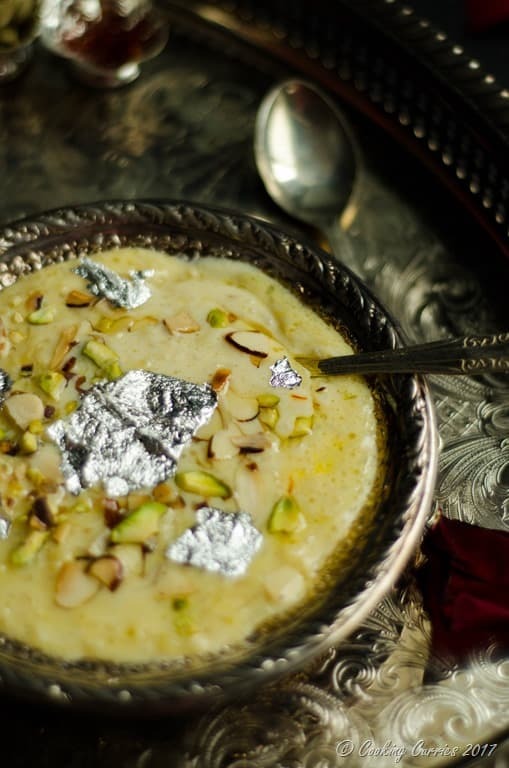 All it needs is a little bit of patience when you try to reduce the milk and thicken the kheer. 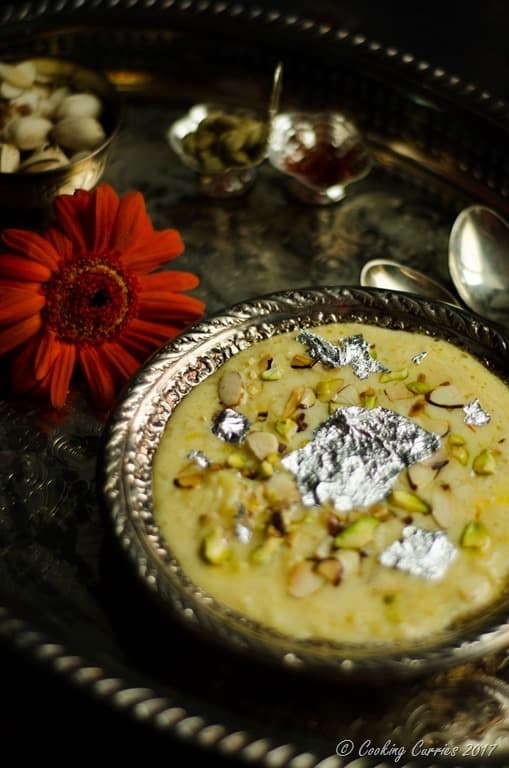 The saffron and the cardamom lends a brilliant flavor to finish the kheer off with. Rinse and drain the basmati rice and keep aside. Heat the ghee in a heavy bottomed pan or kadhai and add the grated khoya to it. The khoya will start to melt and for a pasty liquid. Add the basmati rice to this and saute for a couple of minutes. Meanwhile, warm 2 tbsp of milk and add the saffron to it to bloom the saffron. Add the rest of the milk to the basmati rice - khoya mixture and let it come to a slow boil. Reduce the heat to medium-low and let it simmer for about 30 mins or so till the milk turns color to slight pink and the rice is cooked. Keep stirring every couple of minutes. Add the bloomed saffron and the cardamom to it and mix well. 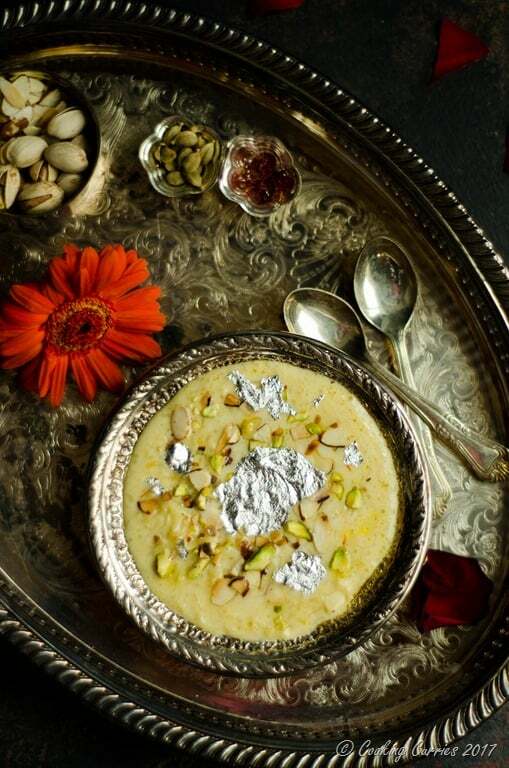 Serve hot or cold with edible silver foil / warq (optional) and sliced pistachios and almonds.